Featuring more than 250 authentic artifacts, as well as breathtaking replicas from the famous ship, the Titanic exhibit truly brings history to life. 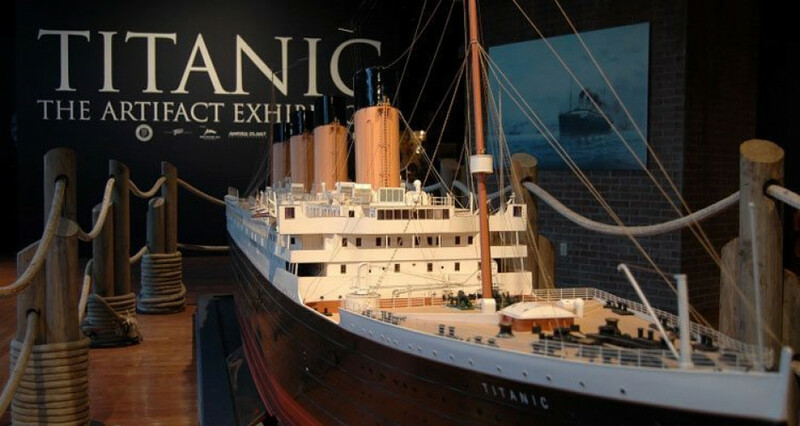 Best Price Guarantee: If you purchase your tickets via the link provided on this page and find a better price for equivalent Titanic: the Artifact Exhibition tickets, Vegas.com will match the competitor's price and refund the difference. That’s customer care you can count on. If you loved the 1997 movie "Titanic," then the Titanic exhibit at the Luxor will blow you away. One of the most heartfelt elements of the exhibit is the personal stories of the passengers. During the tour, the exhibit's staff shares personal tales from the passengers. Some stories have a tragic, yet romantic ending. For instance, some wives chose to stay behind with their husbands instead of climbing onto the lifeboats. At the beginning of the exhibit, patrons receive a boarding pass of an actual passenger on Titanic. On the back of each boarding pass is the age and the itinerary of that person. At the end of the tour, patrons find out if he or she survived the Titanic by finding the name on the wall memorial. 706 passengers survived, but 1,517 were lost. Even if all 20 lifeboats had been filled to capacity, there was only room in them for 1,178 people. The Titanic was the largest moving object of its time. It cost $7.5 million to build Titanic and carried a $5 million insurance policy. It would have cost about $400 million to build the ship today. More than 15,000 men worked on the Titanic for nearly three years to construct the hull and internal structure. More than 100,000 people gathered to watch the Titanic sail off to New York. For a third-class passenger, a ticket was $40 ($900 today). For a first-class passenger, tickets were $4,350 a piece ($50,000 today). In addition to the passengers' stories, other fascinating details include their belongings. You'll discover the Titanic passengers brought their own china and silverware. Each cup, plate, pitcher and bowl has its own interesting, distinct look. One of the exhibit's unique pieces discovered is the au gratin plates set, stacked neatly in rows. The au gratin dishes were found lined up inside of a wooden crate that had deteriorated over time -- an image that is recreated in the exhibition. Other artifacts include ship tools, postcards, currency, a pipe, a spittoon and playing cards. While the tiny pieces leave behind a lasting impression, The Big Piece -- a huge piece of the ship's hull -- definitely stands out. This piece is currently the largest Titanic artifact ever retrieved. The Big Piece weighs an astounding 15 tons and measures more than 26 feet long. In addition to the artifacts, the exhibit also features amazing replicas from the Titanic. One of these includes the staircase replica. Most remember the staircase scene in "Titanic" with Leonardo DiCaprio and Kate Winslet. Seeing the staircase in person brings the Titanic to life. The staircase is where first-class passengers met, mingled and admired each other's outfits. The intricately-detailed staircase replica includes iron, bronze and even the stained glass dome. Visitors have the option of having their picture taken and purchasing it at the end of the tour. Other noteworthy replicas include the promenade deck (which features the sounds of waves crashing and a starry sky) as well as an iceberg, which guests are more than welcome to touch. Since the iceberg was specifically created for the exhibit, it contains its own cooling system to prevent it from melting. Make sure to stop and take a look at the third-class and the finely decorated first-class sleeping quarters. Adorned with burgundy colors, elegant décor and mahogany accents, the first-class suite was considered more luxurious than any hotel room on land in its time. From young to old, visitors of all ages will enjoy this exhibit. There is also gift shop for those who want to take a piece of Titanic home with them. Visitors can purchase everything from T-shirts, stuffed animals, captain hats for kids, cups, key chains and much more. Titanic's overall experience gives guests a better perspective and appreciation of what happened on that fateful night. It allows visitors to remember the story of Titanic, especially the heroism of the crew and the passengers that were lost that night. Near the intersection of Tropicana Avenue and the Las Vegas Strip, inside the Luxor.